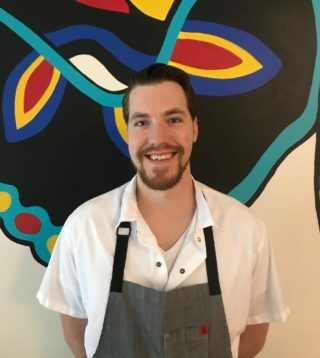 Executive Chef Ted Williams says he joined Perch + Plow in late 2017 at the ideal time–when the menu was a blank slate and the kitchen was empty. Nothing is more rewarding than building something from scratch according to Williams. Just home from a year at Morimoto in Honolulu, Williams was ready to trade in his surf board and Aloha spirit to meet the challenge of opening a new restaurant. For Williams, 28, the hard work has been more than worth it. His passion for cooking started as soon as he could stand on a chair at the kitchen counter. He quickly moved from kid fare to the family barbeque and embellished his dishes with just-picked veggies from the garden he helped tend. Williams joined the Culinary Arts Program at Mario Carrillo High School under the capable direction of Mary Schiller who fueled his fire to cook. Upon graduation in 2008, Williams left the classroom behind, preferring to develop his skills in the restaurants of Sonoma and Napa counties. Armed with a portfolio of photos, Williams responded to an ad for a job fair at Francis Ford Coppola Winery in Geyserville and was hired on the spot by the chef to work the pantry station at Rustic. Soon he advanced to line cook and worked the wood burning grill turning out enviable steaks and chops. Williams then hopped over the hill to Calistoga where he worked at Brannan’s Grill and Barolo. The experience in Calistoga was invaluable and Williams loved the small-town atmosphere, but he says something was missing. When a friend told him about an opening at the Michelin-rated Cotogna in San Francisco, he couldn’t resist the opportunity. From poke to pork belly, Williams has built a culinary home at Perch + Plow where he continues to serve up his artful small plates featuring the best ingredients Sonoma County offers. When he’s not at work, Williams can be seen around town with his Golden Retriever, Sandy, playing softball and working in his home garden.